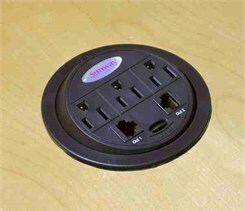 Stylishly converts any desk, table, or counter into a ready-to-access power center. Perfect for conference rooms. Allows easy access to a secure internet connection along with a power source. Simply rotate the PowerTap with its easy access 180° rotation system and the power center is ready to use. * Hole cut size = 4.21"
* For customer installation in existing conference tables, desks, counters, etc.